Contains no yeast, dairy, egg, gluten, corn, soy, wheat, sugar, starch, salt, preservatives or artificial color, flavor or fragrance. In addition to strength and endurance, Zinc Magnesium Aspartate has been shown to accelerate healing and tissue repair. Scientific research has demonstrated that rigorous exercise & stress result in significant body losses of zinc & magnesium. These mineral deficiencies are common in the general population & even more prevalent in athletes. It contains zinc monomethionine aspartate, magnesium aspartate and vitamin B6. It is an all-natural product that has been clinically proven to increase anabolic hormone levels & muscle strength in athletes. Any bodybuilder looking to gain strength, increase athletic performance, & muscle mass should consider taking Zinc Magnesium Aspartate. 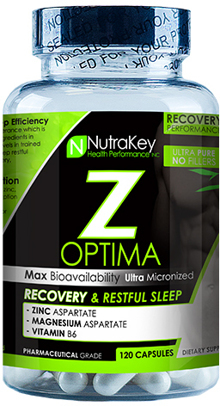 Zinc Magnesium Aspartate increases muscle strength & promotes a deep restful sleep which is extremely important for maximizing healing, recovery, regeneration & growth. Zinc Magnesium Aspartate is a uniquely synergistic formula designed to be used in conjunction with an effective exercise program. First product developed specifically to enhance recovery by improving sleep efficiency. Zinc Magnesium Aspartate promotes a deep & restful sleep & restores exercise tolerance which is decreased by sleep deprivation.